Installing a new hardwood floor in your home? It’s not just the wood that will make a difference. It’s also the finish – the sheen – that will determine how it looks throughout your home. Polyurethane floor finishes typically come in four different sheen levels. A finish’s sheen level is determined by measuring the amount of light that reflects off the floor at a 60-degree angle. It measures how shiny or glossy the finished floor is. Different people have different preferences. The glossier you go, the more light reflects off the floor, This in turn will show more dirt and dust, and will also allow imperfections to shine through. Different types of woods will also produce different sheen levels. Open versus closed pore woods will produce subtle variations in sheen level. Satin produces a 40 percent luster. It has some sheen but doesn’t appear too glossy. It gives the room both a classic and a contemporary feel. It shows scratches, imperfections and dirt less than other sheen levels, which means its easier to clean and maintain. It’s currently the most popular and stylish sheen used on hardwood flooring. A semi-gloss finish produces a 55 percent luster. 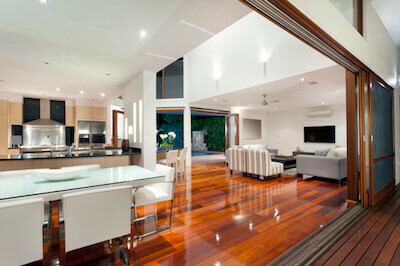 It is generally used on hardwood floors where homeowners prefer a shinier finish. A gloss finish produces about a 70 percent luster. You will typically see this level of sheen on a gym floor or a bowling alley. It is often used on certain exotic woods to complete the look. A glossy finish tends to show every spec of dust, every dent in the floor, every footprint. These floors require more cleaning and maintenance than other types of finishes. Is there a right choice? Nope, its all in your preference. If you want to learn more about finishes and need help determining which is right for your flooring, your lifestyle, give us a call today.